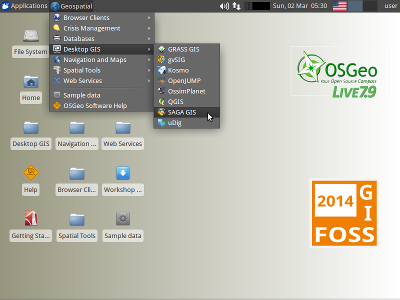 OSGeo today announced that the OSGeo-Live GIS software collection version 7.9 has been released, featuring more than fifty open source, standards compliant geospatial desktop applications, web applications and frameworks. This release is a modernization update to last year's 7.0 release including new versions of the software but preserving much of the core build and operating system. In addition we've added a number of small fixes and updated document translations. Twenty two geospatial programs have been updated to newer versions. The core geospatial stack has also been upgraded from UbuntuGIS, and the base operating system has been updated to Xubuntu 12.04.4 LTS, including all the latest security and bug fixes, and web browser updates.